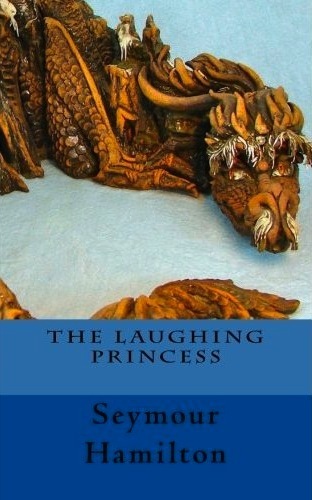 For your reading enjoyment, here is the ninth story from Seymour Hamilton’s The Laughing Princess. I’m a writer and this is the single most inspiring story I have ever read. There was a poet who had wandered from city to country to town until he owned a fine stock of memories both happy and sad. He had shipped aboard a leaky boat with a curmudgeonly skipper and had blistered his hands on ropes and fishing lines for months, until he was heartily sick of the sea. At length, he had come to the Village at the foot of the mountains that brooded in purple shadows while the clouds tore to shreds on their peaks. After the boat had made fast to the stone quay that formed one side of the Village square, the moon rose and the snow on the crags was lit with a ghostly light. 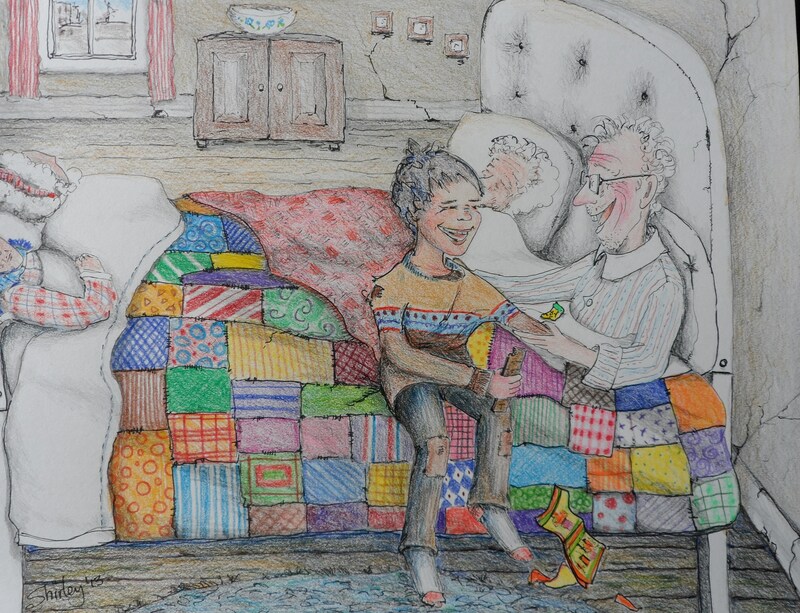 Though he had been awake for two days while his vessel was storm-lashed and nigh to overwhelmed by raging water, nonetheless the poet could not sleep. He went ashore and walked among the houses of the Village, where yellow candlelight gilded the windowpanes and silhouetted those within. He heard the murmur of voices and felt a stab of heartsick loneliness for the home to which he could never return, and a longing was upon him to stare into eyes kind enough to see him for himself and accept what they saw. He passed a tavern, and heard the discordant sounds of revelers far gone in their cups, and he wondered why he should be restless when his fellow mariners sought oblivion in drink, or lay exhausted in salt-wet hammocks aboard their evil-smelling boat. He turned his steps southwards and walked beyond the Castle to where the cliffs drew back from a stony beach silvered by the eerie light of the moon. Shingle scraped under his heels and he drew his jacket tight around him, wishing for he knew not what. It was not that he had lacked comrades, lovers and good friends, but they were lost along the difficult leagues he had travelled, and now he could revisit them only in memory. There had been a time when he thought to make of his voyaging a never-ending river of poems that would touch the hearts of all who heard them, but now the source of his inspiration had dwindled to a trickle of disjointed words. Whenever he took up his pen or mused over rhymes and rhythms, he was driven to the conclusion that there was no one who would care to hear what he struggled to say. “There really isn’t much point to it,” he said aloud to the night. Like all poets, he talked to himself often, but on this occasion when he tried to continue, he could manage only an ironic laugh that threatened to turn into a sob. He kicked the stones under his feet and stared seaward at the ghost-white crests of breakers as they crashed along the shore. 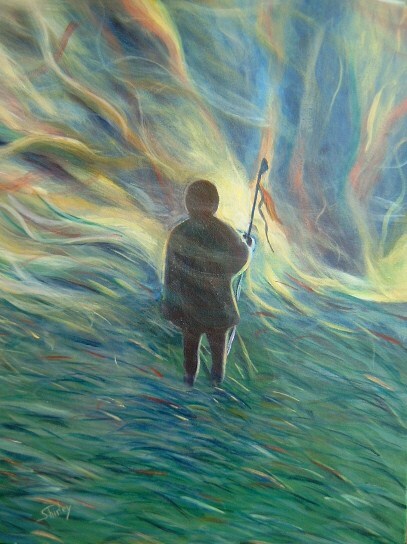 He shivered as he walked along the line left by the receding tide where the waves had tossed up storm-wrack mingled with ruined pieces of men’s handiwork. A broken oar poked up from a tangle of twisted tree roots, and his feet crunched on the fragments of a broken bottle. Ahead of him was a wrecked boat, drifted deep into the shingle by the pounding waves. Its upturned hull was sliced into an enigmatic shape of dark, convoluted shadows. At one moment he saw a huge bird, then a coil of rope stuck with broken spars and masts, then the bony skeleton of a monstrous sea creature. The poet stopped and stared about him, for in all his musings he had never been questioned so appropriately. The poet stepped towards the figure on the boat, that now he saw was a seated woman, her arms folded about her knees. “You bind words to escape from the knowledge that it is your own mind that shapes your life,” she said. He stepped towards her outstretched hand, then blinked and looked again. Lit by a light that was not of the moon, he saw eyes whose slit pupils watched him steadily, and he knew that he spoke to a Dragon. Such was his loneliness that he was not capable of fear. Instead, he was captivated, and saw beauty in the gentle curve of its mouth and the soft gleam of its eyes. He felt a bond between his humanity and the inhuman creature, and both his intelligence and his feelings were convinced of its gentle and kindly interest in him. “All that opposes you is only as real as you imagine it,” said the Dragon. The poet knew that the Dragon spoke of more than the moment, and he was moved to admit his deepest sorrow and the cause of his midnight quest. “Has there been no such moment for you in your life?” asked the Dragon, like a lover in whom there is no jealousy. “I could be wrong,” he said. And the poet sighed as if he had put down a heavy burden. Clouds sailed across the moon, and in the darkness he fixed his gaze on the Dragon’s glowing eyes. “Who can I thank for these good thoughts?” he asked. A laugh like the chime of high, distant bells mingled with the sounds of the sea. Again there was musical laughter to join with the night sounds of wind and wave. And the Dragon bent her head towards the man, and the poet heard the name Kaiwheil Bhagmani-ji, and was content. The harmony of shared compassion filled his soul, and he pressed his palms together in token of his thanks. He could find no words to thank her, so he closed his eyes to savor the syllables he had heard. When he looked again, the beach was white with moonlight, and he faced an upturned boat. He tipped back his head and saw a shape sharp as knives and soft as a woman’s lips scudding down the night wind. And the poet smiled, because he knew he would hold the moment precious, and that he would continue to search the world for the stuff of which his poems were made. 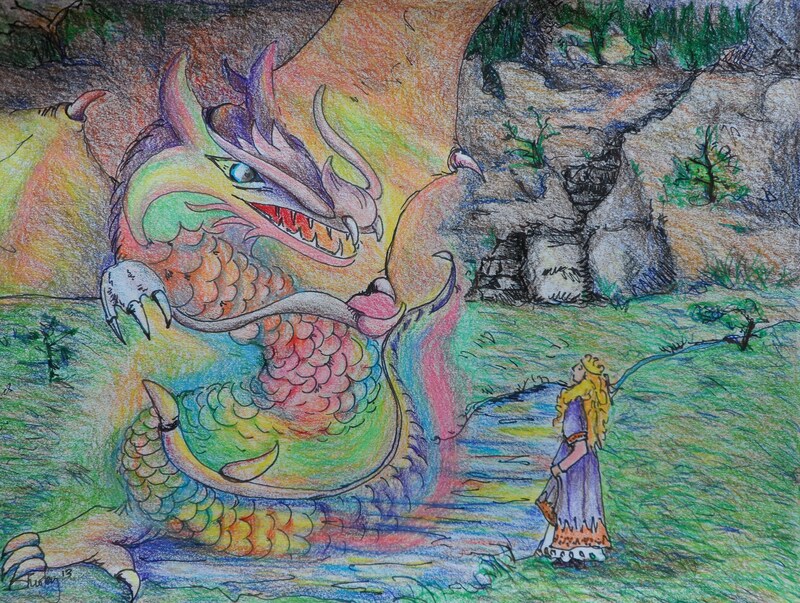 The Dragon drew its sea green wings in a little closer around the two children, and they looked out under the massive arch of leathery scales towards the little bay, now shimmering in the late afternoon sunlight. The shadow of the cliffs was almost to where the Dragon’s tail lay in serpentine coils on the beach. “I thought you wanted to be a warrior,” said the Dragon. Daniel gave his head a little shake. And the Dragon told the story of The Witch and the Tavern Wench. 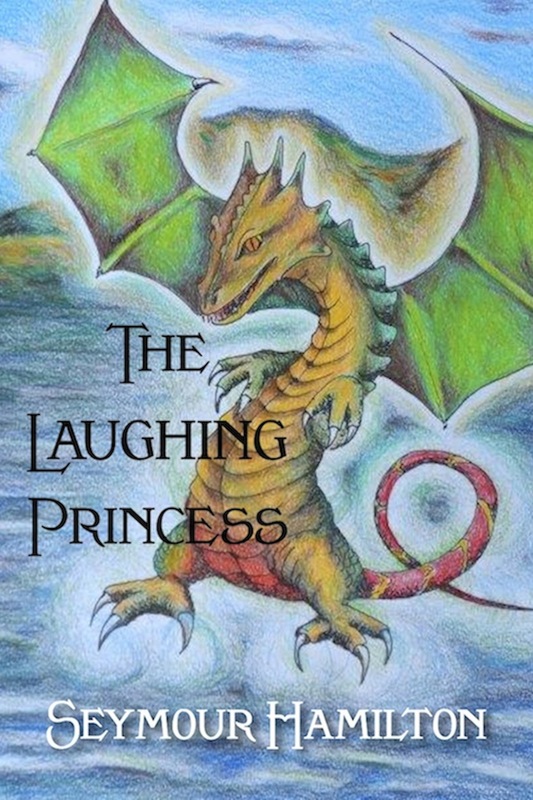 The Laughing Princess is available in Kindle, Nook, Kobo and paperback and as a free podcast at SeymourHamilton.com. Una edición en español se hará disponible en otoño.